Enjoy the beauty that is Kauai in this charming studio. Relax and dine on the private, large lanai with an ocean and park view. Go to sleep in the king bed accompanied by the sound of the surf. There is everything you need for a comfortable stay in Paradise. The beach is Just 20 yards away for great snorkeling, surfing, and swimming. Watch whales in season and surf with the locals at Pk'S, Centers, and Acid Drop. Snorkel with the sea turtles and look for a resting Monk Seal. Second floor, no elevator but the ocean and mountain view is worth the steps! Enjoy beautiful landscaped grounds with exotic plants, a swimming pool, Koi pond, and gas BBQ. Golfing, scuba, hiking, kayaking, biking, shopping and dining is all nearby. We lead busy lives like everyone. We feel fortunate every time we come here to be able to slow down and smell the plumeria. The beauty of Kauai astounds us with each visit. Location, Location, Location. 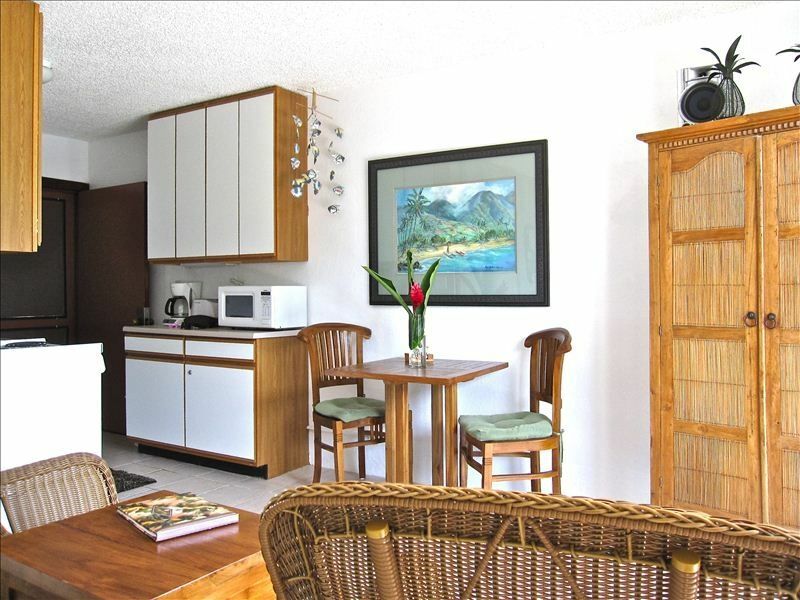 The condo is just across a small road to one of the best snorkeling beaches on Kauai. The charming and historic town of Koloa is nearby. South shore sunsets are not to be missed. Prince Kuhio is a perfect location for us to enjoy the beauty of scuba diving. It's close to so many activities and services, and it's a fine place to relax on the beach. This studio was exactly as pictured and described. It was great to have a lanai with view of the ocean, and it provided a good night’s rest on a comfort top bed. It was breezy enough to make using the noisy and AC unit unnecessary. Covered parking was conveniently close to the unit. I would certainly recommend it to a couple or single traveller who wants to be within easy access of everything that makes Kauai so special. Great value, semi-private, park and partial ocean view, cool breezes and A/C! This studio is perfect for 1-2 people! The property is quiet, with friendly, mostly retired people owning or visiting. The park on one side and the pool/garden on the other side (with gas BBQ) makes this property kind of an oasis, considering the prime central location across from the Beach House restaurant/Lawai beach. We snorkeled/hiked and watched the sunset from the lawn/beach area there almost every night - so beautiful! The condo has it's own patio with chairs and table overlooking Prince Kuhio park. We loved the end location, easy to get to from the parking garage, through the garden, but we didn't have people walking by, so we felt this unit had a "semi-private" advantage over other units. The A/C cooled the condo quickly, when we needed to use it. At night, the fan with the slider open was great and we could hear the ocean. The bed/bedding is very comfortable. Kitchen worked great for us, cooked breakfast and dinner most days. It has a smaller stove and oven . Fridge is mid-size. Cupboards are not new, but well-stocked with dishes and utensils, soap, toiletries, all the basics. It saved us a lot of time and money on vacation-just what we wanted. The shower is smaller, but well-designed. My 5'11" hubby fit, the water was hot with good pressure. We loved the details like "shell" handles in the bathroom and the closet area. Things were designed to WORK really well in this space. We liked it better than the larger condo we stayed in at Princeville, which was much more expensive! The parking was very convenient, self-checkin office open all hours so you can get your parking pass whenever you arrive. There was even a place to wash your feet coming in from the beach AND your vehicle- very helpful after our 4WD trips up Molili Ridge and to Gillem beach! The location was convenient for Lihue: Costco, Safeway, and Jack Harter open doors helicopter tour (the BEST); all of the South Coast beaches plus Waimea Canyon hikes. We will definitely stay here again - hopefully soon! Owners were prompt and friendly in communicating, from inquiries to reservations to suggested activities and returning deposit. Thanks! This place is great! Its small but has everything you need. Perfect for a couple or one person. The beach is right across the street. The Beach House restaurant as well where you can sit and be mesmerized by all the surfers while drinking a mai tia. Other restaurants are just a 20 minute walk or a 5 min drive. There is a couple of local markets as well. Parking is right near the condo as well. Its very cozy and is close to everything. I will go back there again..
What a charming little studio! Very well-appointed in an exceptionally well-maintained complex. La Rhea is such a pleasure to deal with and will accommodate your every need. I can't recommend it highly enough! My husband and I stayed here for one week and could not have been more pleased. The location was superb, the unit was clean, well-appointed, quiet, and had everything we needed, including beach towels, beach chairs, TV, comfy bed, nice separate kitchen area with full-size appliances, plenty of cooking and eating utensils, microwave, toaster, coffee maker, etc. The bedroom led to a balcony that looks out to Prince Kuhio Park. The park is beautiful and quiet. Across the park you can see the ocean. Absolutely gorgeous park and ocean views, and sunrises right from the balcony. Walk across the street to the best snorkeling on the south shore. Down the road a bit is another good snorkeling area, the "touristy" Poipu Beach. Down the road a bit is Lanai International Center; look it up on the internet, and if you share their values you should not miss an opportunity to visit. They only give tours the 2nd and 4th Sunday each month, and this was one of the most memorable things we did on this trip. The condo is right around the corner from a great mall, with a wonderful farmers' market on Wed. A bit further down the road is "The Crack" restaurant (a hole in the wall with great burritos--fish and pork are the best!). Down the road a bit more is Old Koalo Town--nice shopping and food. Overall, this condo was absolutely beautiful, the location was superb, the price was fantastic, and we would love to stay here again. My wife and I spent two weeks in this studio in February. The south side of the island is the best place to locate during the winter months and this condo is well equipped to service two people. It is spacious and with the lanai door open it seems larger yet. This unit is well appointed and kept very clean. It is well situated to take advantage of the Poipu area and only a couple miles from Koloa. The condo is well represented by the photos on this website and is well managed by the owners, La Rhea and Bruce. A definite bargain on Kauai!